With your tax-deductible donation to the Buffalo Bill Museum in Le Claire, Iowa, you will receive one of the following *prints in accordance with the attached donation chart. 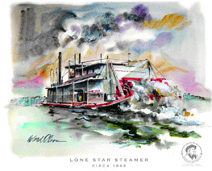 Your donation will go directly towards restoration of the "Lone Star Steamer". Thank you for helping Save Our Steamer! Lone Star Steamer was built in 1869 at Lyons, Iowa for Captain Sam Mitchell*. He ran the Davenport to Buffalo, Iowa trade. The boat was not very fast, had limited accommodations, and was withdrawn at the end of the second season. In November 1876 Captain Mitchell sold her to Goss & Company, Sand Dealers in Davenport. They made a towboat of her. It originally was built as a wooden hull, wood burning, side-wheeler; worked as a barge pushing logs down the river. It was 28 tons; 68.4x19.3x3.2. In 1899-1900 it was remodeled at Kalke Boat Yard in Rock Island, IL at which time she was probably changed to a coal fired steamer and it was probably then that the high-pressure tubular boilers were added. The "Texas" upper deck and four cabins of the crew were added in 1922. Twin tubular boilers, condensing engine 5 ft stroke, mud drum, steam powered wench and steam powered dredging equipment. Somewhere along the line the addition of "Monkey Rudders" were placed behind the paddle wheel, which was a great improvement when backing the boat. The Lone Star has two sets of small rudders, one-wheel operated and one foot operated. One is steel and one is wood. The boat ran with a four man working crew - Captain, engineer, fireman, and one deckhand. It carried eight people aboard for a total crew, four working and four sleeping. The Lone Star did have a woman cook; she was usually the Captain's wife. It was last used as a sand dredge working boat. It had an usually long river life of 99 years, most wood hull boats had a life of around 35 years, then they usually catch on fire from sparks. Its last run on the Mississippi was November 1967. It has been dry docked in LeClaire since 1968. Nowadays the tugs are steel hulls and oil burning.